Southern Utah is a spectacular chunk of planet earth. Deserts, canyons, mesas, mountains – it’s all here. There is good reason so many national parks and monuments dot the region. There is also an abundance of epic singletrack and accessible but remote jeep trails, game trails & ATV trails. The area is ripe for a self-supported epic MTB route. The Trans Utah vision is to devise a route from St George to Moab that can be done in about a week under the self-supported ethos. The route is currently established from St George to Escalante over approximately 400 miles and 60,000′ climbing. The first 170 miles includes a lot of dirt road/double track with some singletrack and decent (relatively speaking) services. Beyond Brianhead the route gets more remote, rugged, wild, with more singletrack, elevation and more difficult conditions. The profile for StG to Escalante – it underestimates both distance and vert. Low point is about 2,400′ at the Virgin River, high point is 11,033 near Brian Head peak. Oct 9, 2009: StG to Escalante. The route has yet to be ridden in it’s entirety in a single attempt. It’s wild country. Check out Dave and Marshal’s trip reports. The route is a big one. Check the map here. TransUtahV2 is the current route – the earlier route isn’t actually doable due to private land access. The route/GPS track will be refined using actual GPS data acquired in the ’08 attempt. Complete tracks for the C-Trail, FR 265, Marathon Trail and trailheads forthcoming. In addition, the final 30 miles may get some re-route action for ’09. Start at Desert Cyclery, StG. All together prologue until the beginning of the Stucki trail. Micro loop, down Curly, up Blakes, Left to Virgin crossing. Into the AZ strip – follow power lines loosely for 20ish miles. Kolob road to junction with cutoff to Webster flat road. Cedar City to Summit: any route is acceptable so long as it’s done under your own power. Paved frontage on NW side of I-15, dirt on SE side. Pine Lake to Powell point. Biggest view in southern Utah! Powell point down a -30% grade, rideable, alpine singletrack. GPS data, water locations, waypoint descriptions and other specific info available at the Trans Utah forum (registration required). 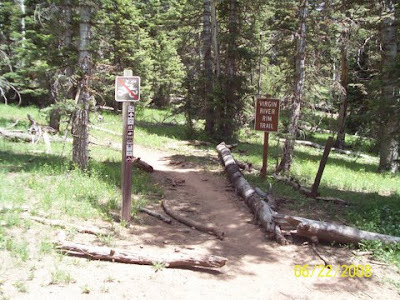 Troy and Blair completed this loop in 2009. The TU forum is dead but the Trans Utah page at http://2-epic.com/?page_id=518 is alive and well and includes a link to the TU gpx track of the 2009 event. “Check the map here” links to a map that needs to be upgraded.